You have a SaaS product. And when a website visitor lands on your homepage, in an ideal world, they’ll take immediate action. The action they take is dependent on how you guide them through your site. One of the ways you do this is through ‘call to actions’ (CTA). Across the web, you’ll find loads of blogs posts pointing you towards CTA best practices. In fact, if you were to Google that phrase, you’d see there were 550,000,000 results. You will also read case studies that say: “We changed our CTA to XYZ and we increased our sign ups by 132439287%. Impressive, but does it work for everyone? ‘Best practices’ are not set in stone. More often than not, they are an amalgamation of what worked well one time for a particular person. We wanted to find out how SaaS companies were using CTAs across their homepages. To do this we analyzed 969 SaaS companies CTAs to see how they’re really used across homepages. A call to action button can aka (CTA). In its simplest form, it’s image or text that encourages your website visitors to take a desired action. You decide what that action will be. An effective CTA depends on how many people take the specific action you’d like. 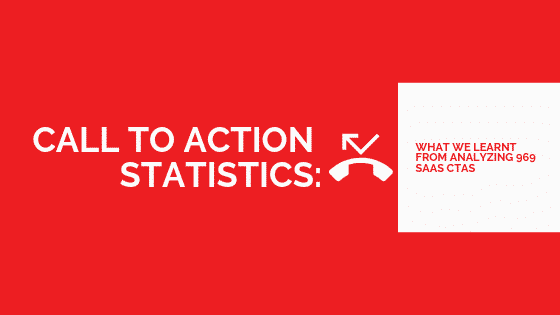 For SaaS companies, the action you might want them to take varies. You could want them to look at your services page. You might want them to download an ebook. The goal of your homepage might be to increase free product purchases. But if the first thing someone sees when they land on your site is a big “BUY NOW” button – do you think they’ll take action? Because you haven’t thought about trying to convince that person to take action. What do the best practices tell you about the perfect CTA formula? What do the industry leaders tell us about how to craft the perfect call to action button? Litmus’ blog post suggests ‘action words’ encourage your target audience to take action. Sumo’s blog post explains the less call to actions you use, the less likely you are to distract your audience. Wishpond’s blog post suggests some call to actions don’t work because they use vague words like “click here”. Hubspot’s blog post reiterates this idea. They promote the avoidance of using words like “submit”. Copyhackers’ blog post shows the importance of adding a benefit to your call to actions. So that’s the call to action button best practices according to industry leaders. But how does it compare to what SaaS companies actually do? Well to find out, we analyzed 969 SaaS company homepages. We wanted to see how they use call to actions and discover whether they’re aligned with what the top advice says. How many call to action buttons should you use on your homepage? 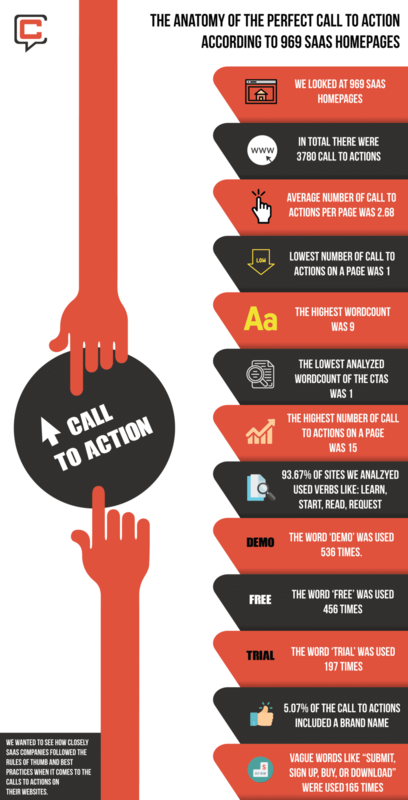 We looked at how many call to action buttons each site used. It’s important to note that for the basis of this research, we only looked at unique call to actions. On many of the sites, they reused the same call to action across the site. 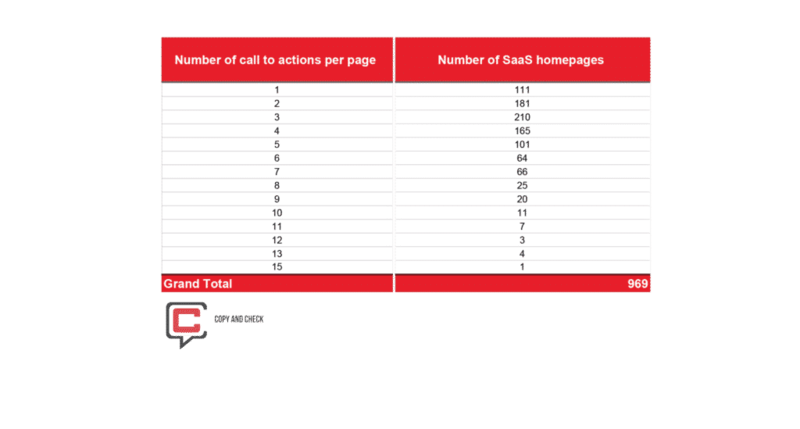 The data tells us 21.67% (210) used three different call to actions across their homepage. On the extreme end, 11.46% (111) of companies had one call to action and 0.10% (1) used 15 different call to actions on their site. Let’s look at how that data manifests itself on actual homepages. Service Titan used the same call to action button on their homepage three times. Does this work for them? If you’re on their site, it’s likely you work in these industries and are actively looking for this type of software. What’s more, they include a range of other trust indicators on their site that encourages people to try the demo. But what about at the other end of the spectrum? 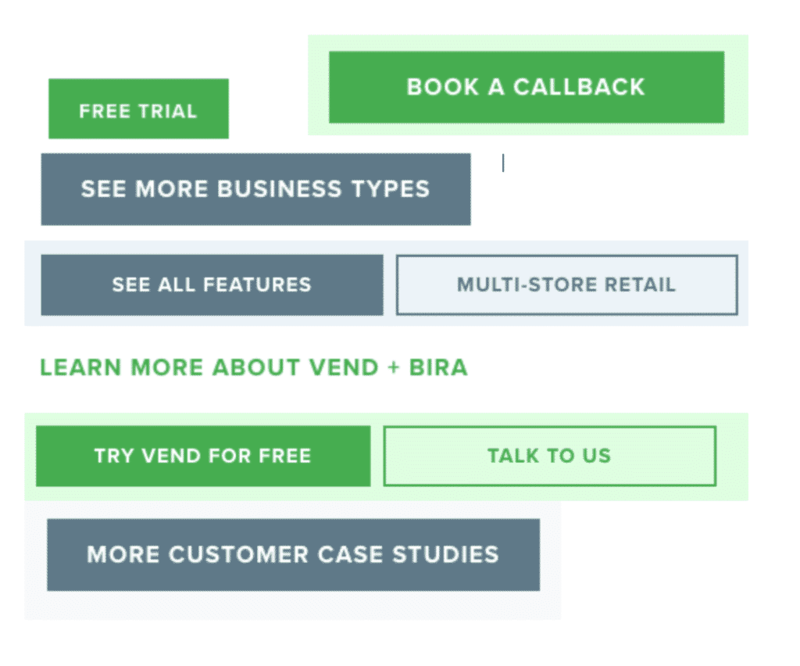 Vend uses 15 different call to actions on their site. You can see a sample selection below. What’s interesting though, is they don’t use the same CTA more than once. Without looking at the analytics and conversion rates, it’s hard to say. It’s clear Vend targets a range of industries (all in the e-commerce space). But as an e-commerce owner, it’s not immediately clear if this service is for you. I do wonder though, whether the amount of CTAs is overkill and reduces the user experience. There could be some benefit in them reducing the number of different call to action buttons. This way the target audience can focus on the most important actions to take. Vend, if you read this, let’s A/B test it! How long should a CTA be? Knowing how long or short to make the anchor text on your call to action button is tricky. Too long and you might not get the benefits across in the right way. Too short and you hinder your conversion rates by people not taking action. But what did the numbers say? We looked at 3780 different call to actions. The lowest word count was 1 word and the highest was 9, with the average being 2.68. But we’ve already established that it’s useful to explain the benefits to convince someone to click. So how do the sites that use one-word CTAs do it? 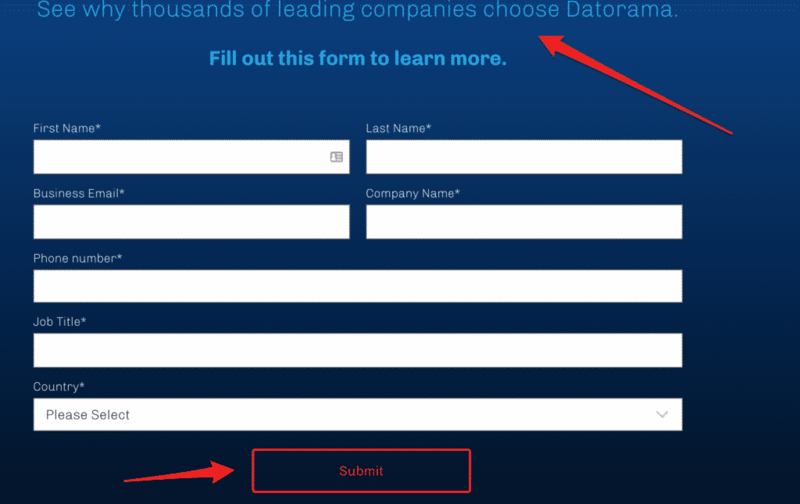 Datorama, for example, uses “submit” as their call to action on their form. When you fill in the form you will understand why ‘thousands of leading companies choose them’. However, what they don’t do is show you exactly how they plan to present this information for you. Do you receive a pdf? Are you going to receive a phone call? Or will someone from the sales team get in touch? This form asks for a lot of details and it’s not quite clear what the benefits will be from filling them in. Potential customers are hesitant to hand over their details unless they know what’s in it for them. It all comes down to the user experience of the landing page they’re on. You need to make it easy for them to navigate your site, know what to click and why. Do CTAs with one-word anchor text work? Without analyzing the click-throughs and conversion rates of each site, it’s hard to tell. But what is clear is if you do plan on using a one-word CTA, make sure you’ve explained the benefits somewhere. 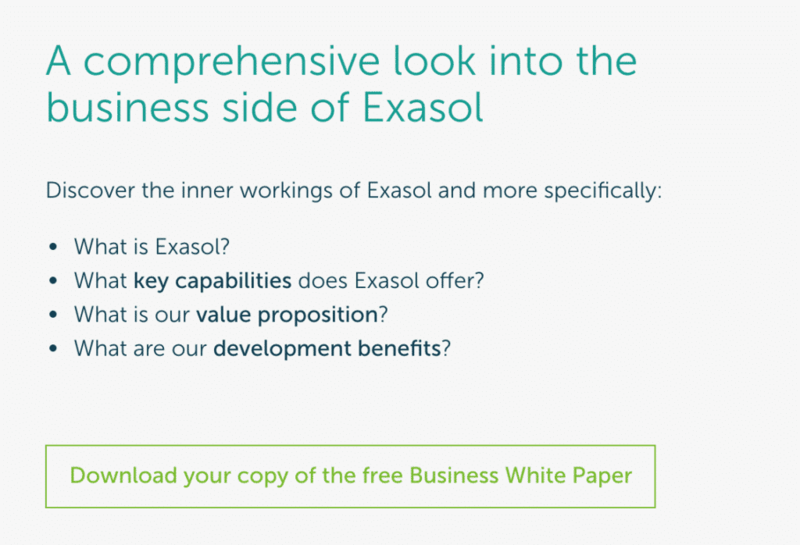 Exasol has a 9-word call to action button on their homepage – very long in comparison to our average (2.68 words). They’ve included “free” and they’ve also explained the value of the whitepaper. What they don’t do is add any sense of time-frame. How long will it take to receive the white paper? Will clicking this link direct me straight to the white paper? These are all thoughts that run through a reader’s mind before they click to take action. Exasol doesn’t add a time frame because when you click on the CTA, you then have to fill in a form to access it. This adds an extra layer of unnecessary friction. Although this is useful information, it should be freely accessible on the website. After all, that’s what a website is for, right? That’s a lot of information to hand over before you’ve even found out whether the company is right for you. What’s the ideal CTA length? 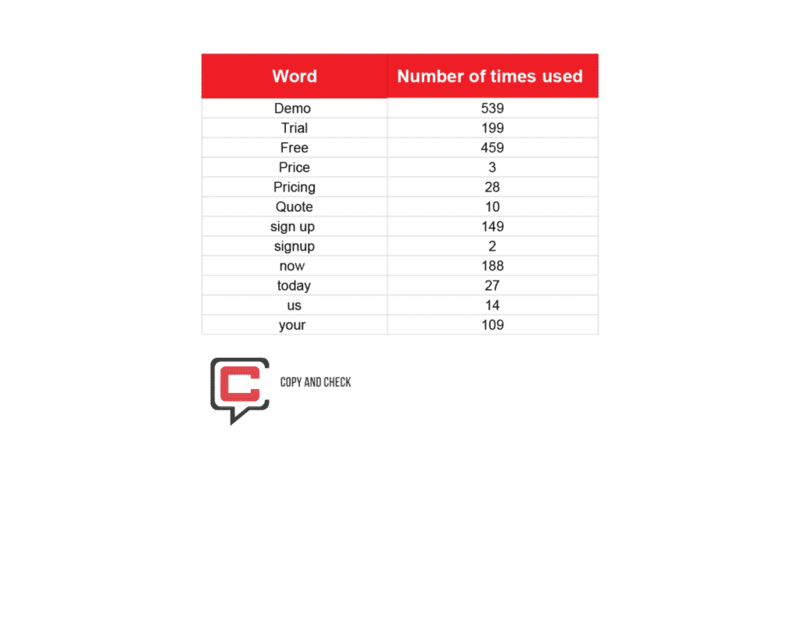 From our research, the word count of your CTA doesn’t matter as much as the context it’s used in. Use a one-word anchor text CTA if there is context about why someone should take immediate action. Use a nine-word CTA if you’ve ensured the key benefits are as clear and succinct as they can be. 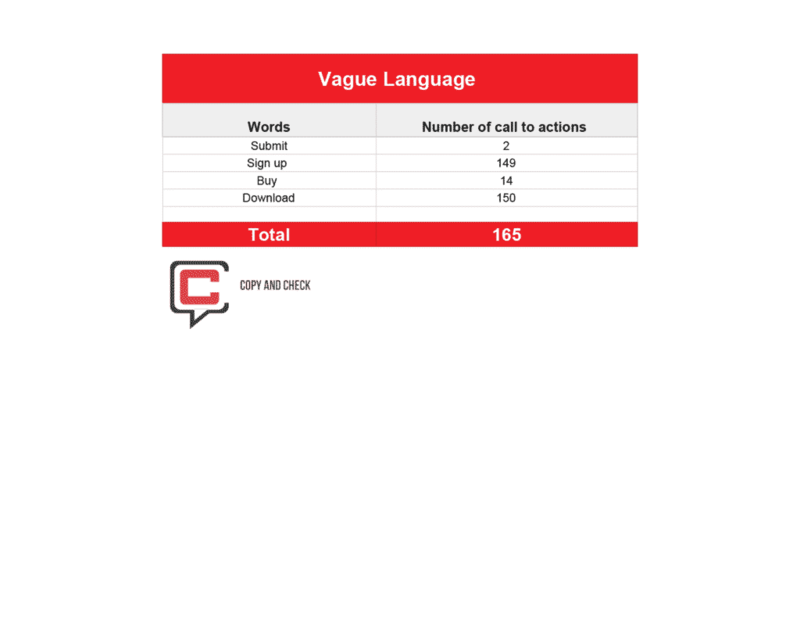 In every article we read about call to action best practices, the idea of using strong verbs came to light. And it makes sense to use verbs in your CTAs as you want the person reading to do something. From the 3780 call to actions we looked at, 239 (6.3%) didn’t use a verb and 3541 (93.67%) did. The trend here is clear, use verbs within your call to action buttons. We also looked at which specifical verbs were most common. 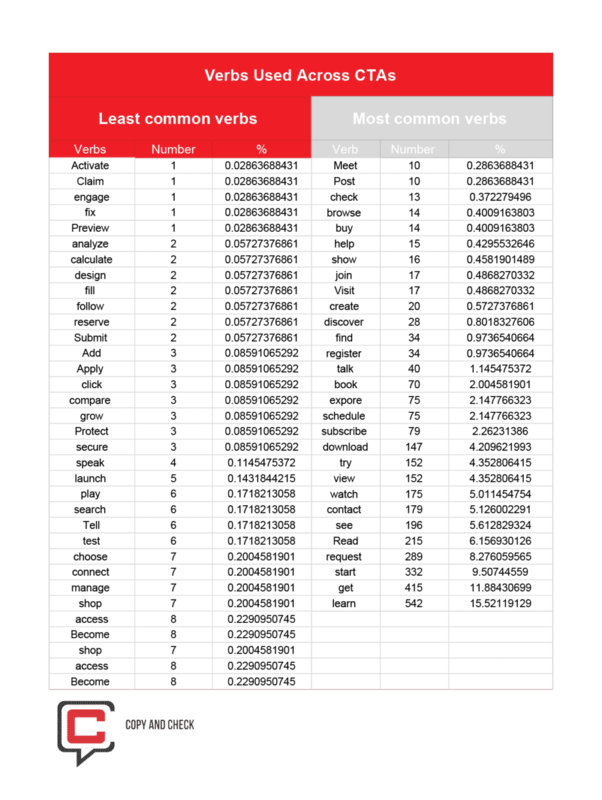 The most common verb within all the CTAs was “learn”, followed by “get”. On the opposite side, the least common verbs were: “preview”, “activate”, “claim”, and “engage”. Let’s look at the use of “get” and “activate”. A good example of a call to action with a strong verb is Wordstream. They use “get” on their call to action above the fold. Starting with the verb forces the person to think about the action. Personal language like “your”, forces you to think about how the resource will benefit you. ‘Free’ highlights the fact the reader doesn’t need to invest money. The use of “today” highlights the timeframe in which you’ll receive the report. Above the CTA they explain the exact value: 40 hours of PPC analysis in 60 seconds or less. Social solutions use “activate” within their call to action. It’s situated in the header of the website and is visible even when you scroll down. They back up their CTA with “no credit card required”. If you start a free trial, you don’t want to forget to cancel your subscription and get charged. Knowing you don’t have to enter your card details gives you the confidence to test their software. It’s visible throughout the entire homepage. If this had been a popup it would’ve felt intrusive and annoying. Instead, they keep it pinned to the top of the site. At any point, when you’re convinced this software might be useful for you, you can start your trial. We mentioned earlier the pitfalls of using vague language within your CTA. We decided to see how many of the sites we analyzed did this. Only two sites used ‘submit’, 149 used the phrase ‘sign up’, 14 used ‘buy’ and 150 used ‘download’. It shows that lots of sites use vague language to encourage others to download their content or sign up. But how effective is using this vague language? Let’s look at some examples. They include a verb and they include a sense of urgency, but does this a good call to action? It’s because of the context it’s placed in. The main headline talks about attending a summit – fine. The subheading talks about the types of people you will hear speak – also fine. But then the CTA asks you to submit? If you click through this CTA you’re presented with a page that encourages you to become a speaker. In this instance, the copy and the CTA don’t match up. Here are two alternatives OpenStack could’ve tried. In this new example, the call to action connects with the copy above. In the second example, we’ve kept the original CTA but instead, changed the copy to better suit their needs. Using the phrase “sign up” without any context to why that person should do it is a bad idea. Free conference call, have this CTA on their homepage. You’ll notice though, when you first land on their homepage, the sign up button isn’t there. This makes sense. If someone has just landed on your site, there’s a slim chance they’re ready to sign up straight away. They only show the sign up call to action button once a user has scrolled down the page. This works because the person visiting the site has had a chance to read through their homepage copy. They are now in a better position to know whether this service is right for them. If you plan to use this tactic on your own site, ensure the rest of the homepage copy convinces someone to want to sign up. You need to explain the benefits of your service. Quell any hesitations someone might have. You need to show them that signing up is a pain-free process. The word ‘buy’ on the homepage is interesting. Unless your homepage copy is stellar, your target audience will be hesitant to buy right away. Encouraging people to think about money is enough to stop them wanting to try your service. This is especially the case if this is the first time they’ve come across your product. Top Producer, a real estate CRM software, uses the CTA “buy now” on their homepage. The issue with this is that ‘buy now’ button copy is intense. What if you buy now and you don’t like the product? What if you buy now and you find the product isn’t right for you? There are so many hurdles you need to cross before someone is ready to “buy now”. Placing “buy now” on your homepage without any sign of how much it costs could be a deal breaker. In Top Producer’s menu, they link to their pricing, but the pricing isn’t on their homepage. So why would anyone be ready to “buy now” without knowing how much it actually costs? The only other option their potential customers have is to give the Top Producer’s team a call. The issue with that is they’ll have to go through a sales pitch and coerced into taking a desired action. 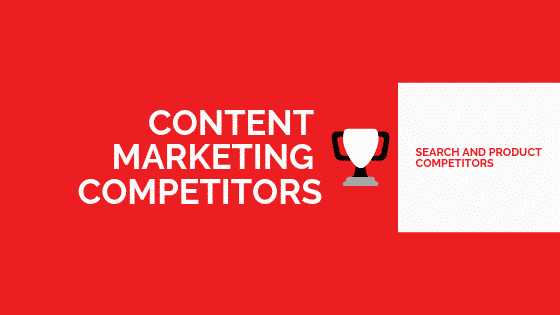 Someone has landed on your site to read through your content. Should you put your brand name in your CTA? We couldn’t find any studies that pointed towards whether this was a good or bad idea. 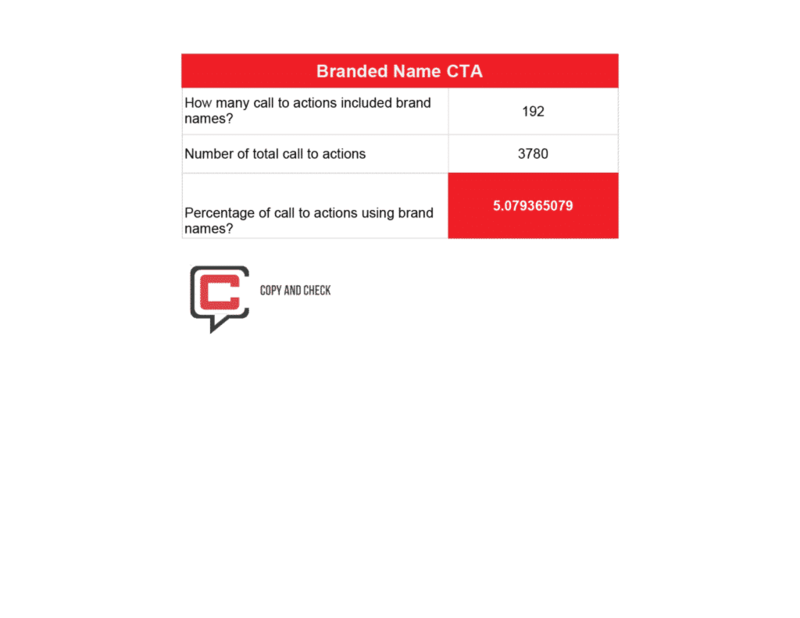 From our own research, we found that only 192 (5.07%) of CTAs included a brand name. 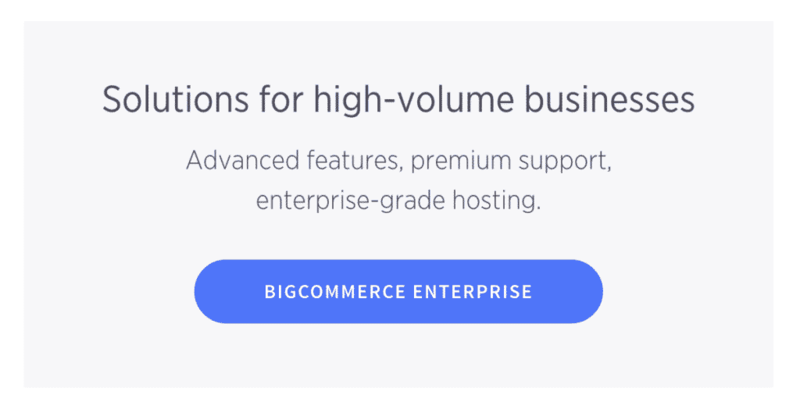 BigCommerce is an example of a company that does this. This is the only CTA on their homepage that uses their brand name, but let’s think about why that might be the case. The first thing that comes to mind is they’re talking here about another solution. All their other CTAs link to pages related to their core offering. This CTA is for people looking for an enterprise solution. It’s effective because it references a different product variation for a different audience. 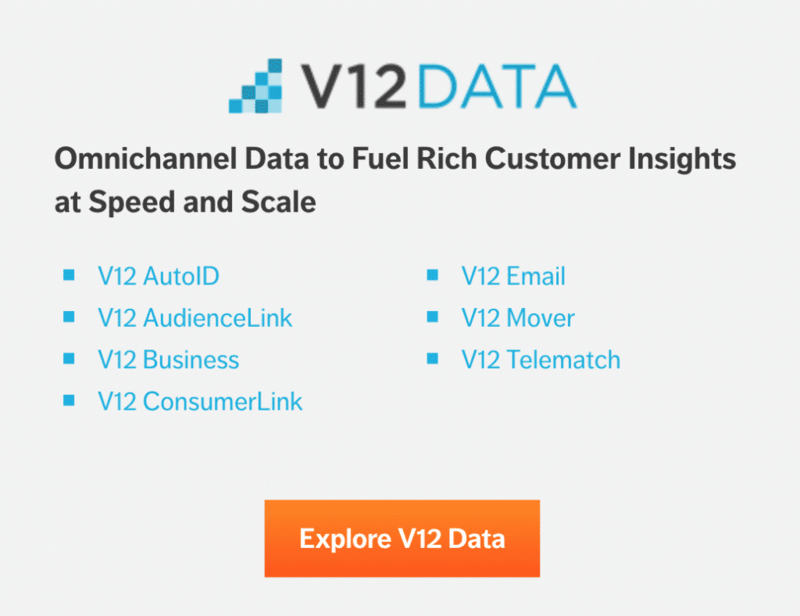 V12 Data use their brand name throughout their CTAs. What’s different about them from BigCommerce is they use their brand name three times. It’s clear they’ve done this because they want to build a brand. To differentiate themselves from other signals. They use their brand name to describe their offering. 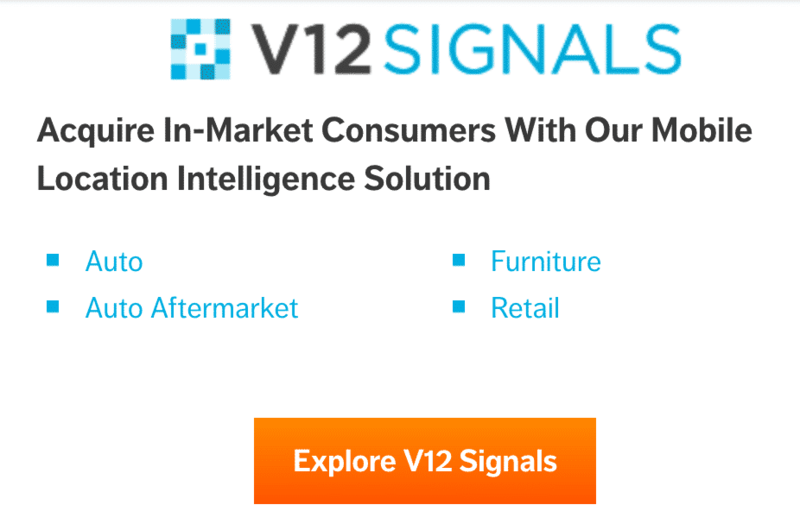 With these call to actions, V12 are trying to get you to understand that they’re different from the rest. This is effective because they’ve used it throughout the entirety of their copy on their website. If you’re going to include brand names within your CTA make sure it makes sense for it to be there. Otherwise, it will come across as spammy and inauthentic. We looked at common words used across all the call to actions to see if there were any patterns or trends. ‘Demo’ was used 539 times, ‘Trial’ was used 199 times and ‘free’ was used 459 times. It’s clear there’s a trend amongst SaaS companies to encourage people to try their software. And it makes sense. Before someone commits to spending a monthly fee for your product, they want to try it out first. 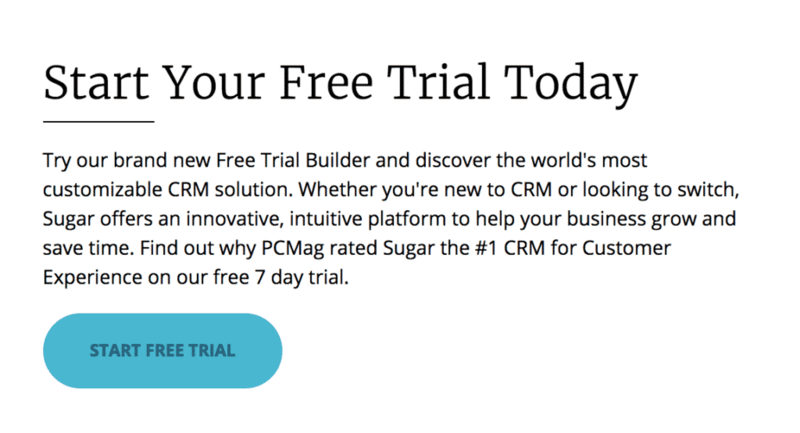 Sugar CRM use “demo”, “free” and “trial” on their homepage CTAs. The image above shows their effective call to action: “start free trial”. They add context and urgency to the call to action button. If you’re unsure whether the product is right for you, the paragraph above reminds you of the benefits. (world’s most customizable CRM solution). The value you’d get (help your business grow and save time). It also adds social proof (Find out why PCMag rated Sugar the #1 CRM) to convince you even further. Here the use of ‘demo’ is effective because it includes a time-frame. Looking for the perfect software solution is time-consuming and knowing this demo only takes 3 minutes is crucial. The primary goal of a CTA is to get someone else to take action, right? So it goes without saying that you should use personal language within your CTA. After all, the best way to get someone to think about you is to get them to think about themselves. What’s pleasing is, “us” was used 14 times and “your” was used 109 times. It’s clear that SaaS companies are thinking about their customers (first). ApsPayroll uses personalized CTAs and language on their homepage. 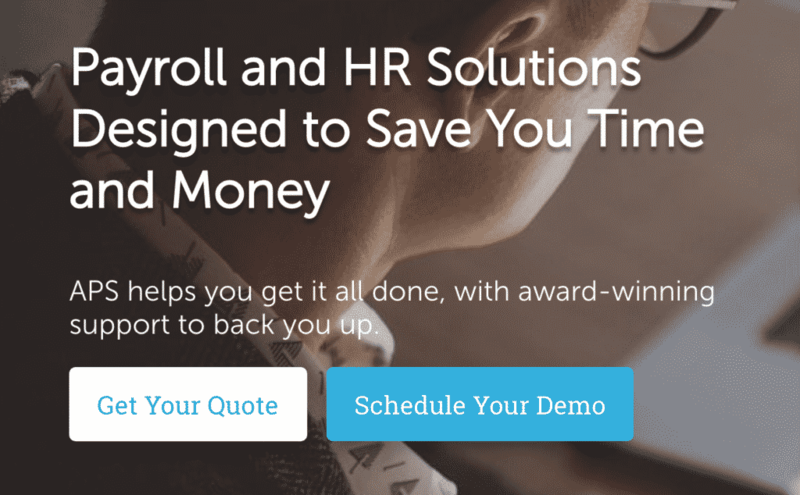 They use “Get your quote” and “schedule your demo”. The use of the “your” in this instance is effective because it gives a sense of ownership to the person who’s reading. Adding urgency to your CTAs is a great way to convince someone to do something. In our study, “now” and “today” were used 188 and 27 times respectively. LiquidWeb uses “today” on their homepage call to action button copy (as shown below). This is one of the final CTAs you see on their website. At this point, you’ve read through their homepage and know whether this is the right product for you. They tell you that getting started is effortless – you can do it all today. They quell any hesitations someone might have with the supporting copy above. You now know they don’t have any contracts. They use transparent pricing and they have a dedicated team available to help you make a switch. If you were on the fence before, the supporting copy for this CTA is powerful enough to make you take action. Well, it’s clear there are plenty of SaaS companies who adopt the CTA best practices, but also plenty who don’t. Although this study didn’t look at the conversion rates for each of the CTAs we analyzed, It did focus on call to action button copy, placement, and context. Moving forward, if you’re going to start implementing CTAs, whether you want to use one, one-word CTA or 15, nine-word CTAs, it’s clear from the examples listed above that context and providing the reader with an understanding is everything. We hope you’ve enjoyed this study. If you’d like to download our infographic explainer, you can grab it here! 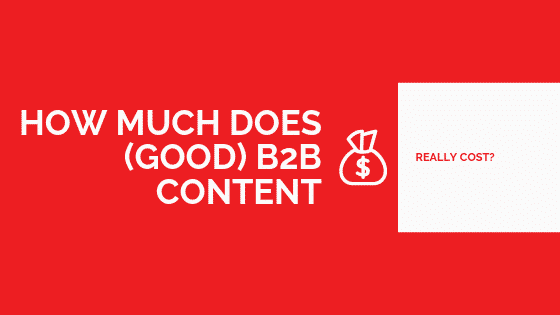 Previous Post How much does (good) B2B content really cost?